The 90’s era of gaming, my favourite era of gaming, it was the era where games would come out on more than 4 platforms, to the range of over 10 or so at one time. 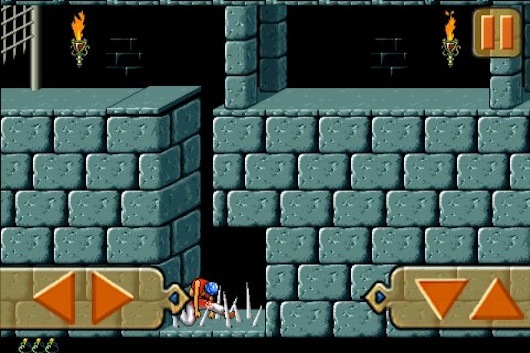 Perfect example was Prince of Persia. I mean this title first came out on the Apple II then Mac OS, DOS, NES, SNES, GameBoy, Amstrad CPC, Amiga, Atari ST, PC Engine/TurboGrafx-CD, Master System/Game Gear, and the Mega Drive/Mega CD. Nowadays if a game is released for cross-platforms, what do we have at the moment: Xbox 360, Playstation 3, PSP, Wii, DS, PC, Mac, iPhone. That is it really. I do have the remake of this on the Xbox 360 as well, which has enhanced graphics, sound and movements, but same level structure. 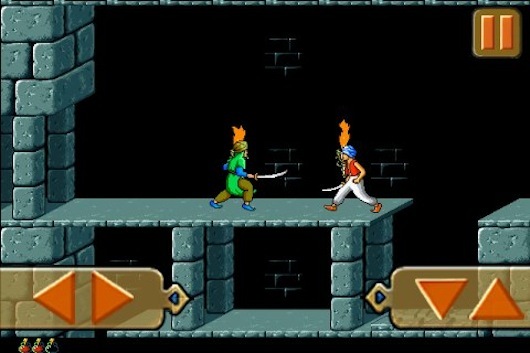 For some reasons unknown, I was more excited to read about the release of the original Prince of Persia, but to the iPhone/iPad platform. 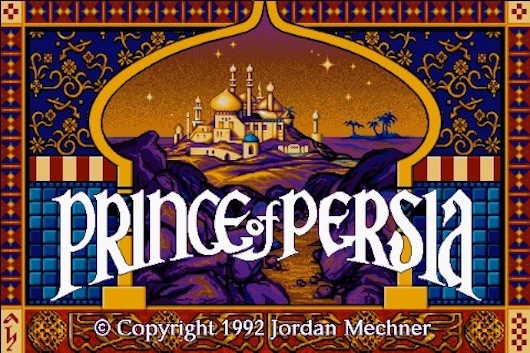 So for the uninitiated to the whirlwind of the Prince of Persia series, the first story starts where the sultan has gone off to fight in some war in another country, so he put the grand vizier Jaffar is taking care of the kingdom in the interim. Jaffar however has other incentives, he wants the kingdom for himself. 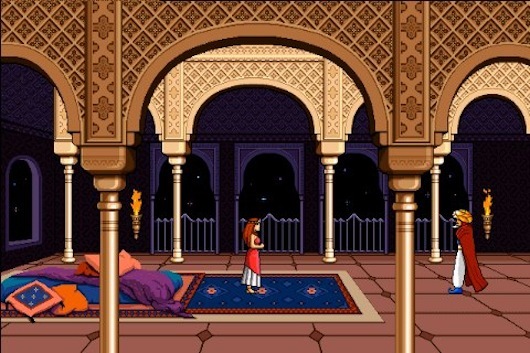 The princess is already in love with somebody else, the main character of the game! Jaffar wasn’t going to take that crap for no one! So he locks her up and gives her two choices.. Get married to someone twice her age, or die within 60 minutes. 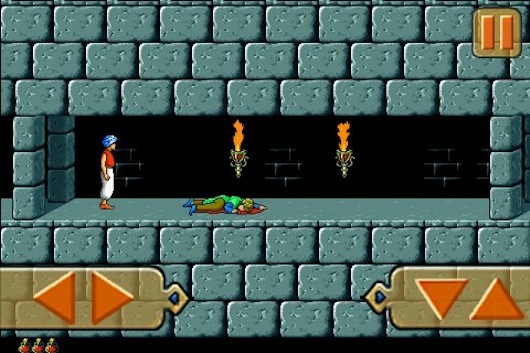 The protagonist gets thrown into jail and well, has an hour pretty much to save the princess and defeat the evil Jaffar. The thing about this game, is that back in the day, there was nothing else like it. 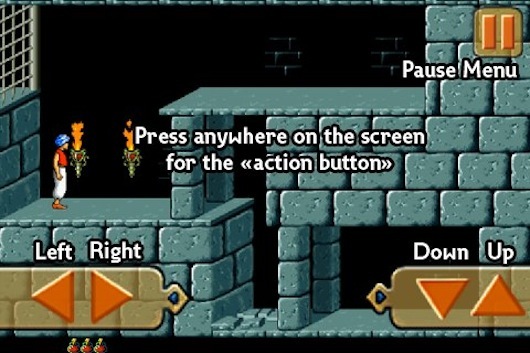 Extremely fluid animations, solid puzzles and strict timing on jumps to avoid obstacles along the way. Simple enough controls right? I tend to hold my left thumb down for running left and right, you can’t really do that in this one, as in you have to let go and press down again. Controls otherwise are pretty good (quite accurate to how it was back in the day). I forgot also how hard the game was back in the day (besides the SNES version which allowed adjustments of difficulty). The guards are so annoying a challenge! Block their sword strike and you get pushed back. The AI is quite interesting in the enemies thankfully, on the other hand…. Graphically and audibly, looks and sounds a lot like the Macintosh version as well, which was the nicer looking one of the ports (besides the SNES one). I admit I got frustrated pretty fast with this game (just like how I did back in the day) from dying mainly from the delay in responsiveness to the controls (it wasn’t an issue with this port, it was a challenging facet from the original games). 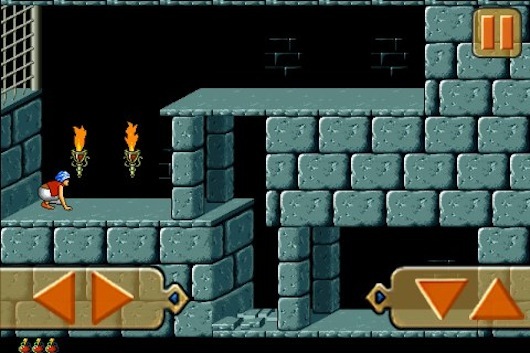 A challenging title with crisp graphics (as simple as possible), and the classic audio quality of the early 90’s to boot, which holds the flame up high to the original feel to the first of the Prince of Persia games, and at AU$1.20 there’s really no excuse to avoid this game. 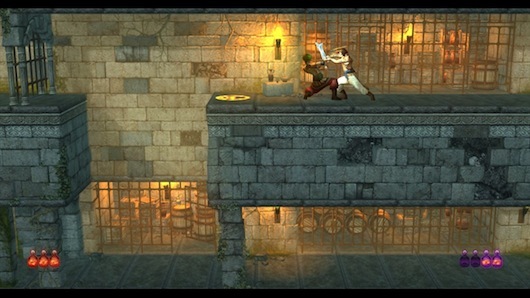 If you’re like me who would have been exposed to at least two ports of Prince of Persia, then this game will be for you. – not being able to test this on an iPad.